Teleport is a great free app that lets you share a single keyboard and mouse between multiple Macs, in addition to providing for a single clipboard and even the ability to drag and drop files between different Macs without using traditional file sharing. This is ideal solution for those of us who have a desk with a couple Macs and don’t want to constantly flip between different keyboards, mice, and trackpads, instead you can use a single Macs keyboard and trackpad/mouse and control them all. Setting this up is easier than you might think, and we’ll walk you through the entire process. It may sound complicated but it’s really not, just follow the steps and in no time you’ll be sharing a single set of input with multiple Macs. And no, there is no limit to how many Macs you can share the keyboard, mouse, trackpad with. For reference, the primary Mac with keyboard and mouse will be referred to as “server” and other Macs as “client”. Before beginning, note that all Macs must be on the same network. Teleport works over both Wi-Fi and ethernet connections, the only requirement is that all machines are on the same network. 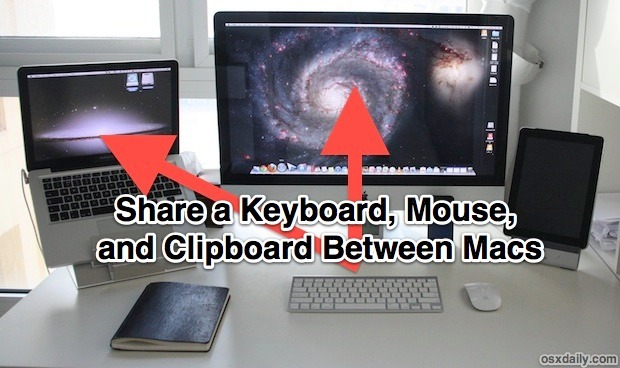 You’re now sharing a single keyboard and mouse between the different Macs! Teleport displays a menu bar in OS X that lets you know where the mouse is currently, and which computer is controlling the mouse. You will also see a quick icon overview float over the desktop when the mouse and keyboard focus switches, making it easy to tell when you are moving between Macs. To move files between the Macs with Teleport, just drag a file from one Macs screen to another, just like you would with multiple monitors. The file transfer works best with smaller files, but it can transport large files too if you don’t mind the wait. The shared clipboard is also simple and automatic, copy on one Mac and you can paste to another, and vice versa. We’ve covered a similar sharing keyboards and mice with Synergy before, but not all users could get it working on their Macs, whereas Teleport definitely works in OS X Mountain Lion, Lion, and even Snow Leopard. 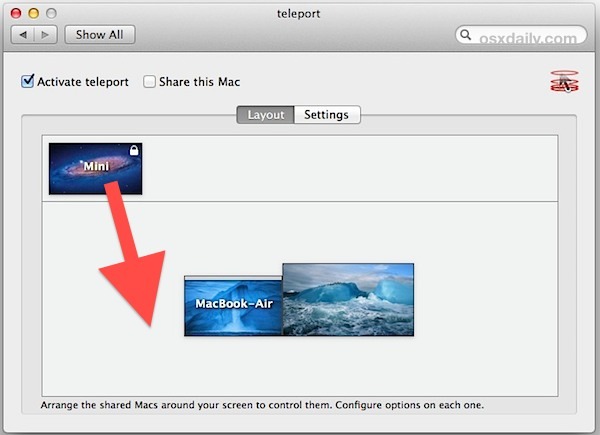 The only downside to Teleport is there is no cross-platform support, so if you’re looking to share a keyboard and mouse between Macs and Windows or even Linux computers you’ll need to use Synergy instead. Sharemouse is a nice cross-platform alternative that is more user-friendly than synergy. Teleport has been around since OS9 and is elegant and simple to use. It is a winner. It will work between different OS versons seamlessly. I have 3 with Tiger, Snow Leopard and Lion using Teleport to share. I’m using Teleport on my 2011 Mac Mini (Mountain Lion), my 2007 24″ iMac (Mountain Lion) and an older 2005 White iMac (running Snow Leopard). I got rid of 2 keyboards and mice, using a Logitech Solar Powered Wireless, USB Mouse and Bluetooth trackpad to control all 3 – Cleaned up desk clutter, and has made transitioning between the 3 for video editing a breeze. Awesome. Just installed it and it works nicely on a Mountain Lion and Lion installation. The only caveat is that using a Wacom tablet is a little wonky. When moving to the new screen, the tablet has trouble re-fitting to the second screen. But it’s great for a quick click or two. All I want to know is, where do I buy that leather bound book? Looks like a Moleskine to me. I’ve been able to link a Mac and a Windows box at the same time to a Linux box (ubuntu) with Synergy. I have this on my 2010 MBP running Mountain Lion and a G5 PowerMac running Leopard, and it all works beautifully! Initially I was concerned about PPC and Intel compatibility but it doesn’t seem to be an issue here. Great Find! Yes. This is going to change my life. I have a 21″ iMac w 27″ secondary screen. I bring in my 13″ MBPro and dock it with a 21″ monitor. now I am using iMac trackpad and wired keyboard. love it. I have been using Teleport for years. The only thing that bugs me are some of the function keys go not work on the guest, like play, volume, and brightness. Other than it works fine and is easy to set up. I like the fact that I can drag and drop files around too. Do this require a wireless keyboard or can a wired one be used? A wired keyboard will work just fine. Albin: You mentioned Synergy. I tried that a few years ago, but the install/setup process was really complicated, but if you where trying multi-platform, then it would be worth looking into as it has plenty of time to mature and hopefully is a lot easier to setup. I’m excited to try Teleport. I really like the idea of being able to drag and drop files. Thanks for the article OSXD! Teleport is a disaster in Mountain Lion. It crashes, doesn’t start at boot. No fix since August. It’s unusable. in osx 10.8.2 teleport does not share keyboard strokes to the guest if you are typing with a wireless keyboard on the host. Everyone can confirm that there was a OS9 version of Teleport and send it to my email address ? I asked the staff at abysoft but they say they haven’t it avalaible anymore.